A common theme of my past research experience in physics is the use of atomic, molecular, and optical (AMO) physics techniques to perform precision measurements which look for physics beyond the Standard Model. Despite the immense experimental and theoretical success of the Standard Model, several crucial questions remain. One of the most puzzling is explaining the current abundance of matter over antimatter, the so-called baryon asymmetry problem. According to the Sakharov conditions, baryogenesis requires a sufficient amount of charge-parity (CP) violation, which we have only found in limited amounts in nature. A non-zero electric dipole moment (EDM) would violate CP, and thus constitute a powerful probe for new physics. The ACME EDM (Advanced Cold Molecule Electron EDM) experiment utilizes the state-of-the-art AMO methods to perform a precise measurement of the electron EDM. The apparatus consists of a cryogenic buffer gas cooled beam (CBGB) of thorium monoxide (ThO). Various techniques are used to transfer as many molecules as possible into the EDM-sensitive -electronic state, where we perform a spin precession measurement. The molecules are prepared into a superposition of states, which precesses as it goes through applied electric and magnetic fields in the interaction region. The strong internal electric field inside ThO amplifies the effective field experience by the electron, boosting the sensitivity of our measurement by many orders of magnitude. The phase of the precessed state is then measured, from which we can deduce the contribution from the electron EDM. The ACME collaboration published its first generation result in 2014, an order of magnitude improvement in the upper limit for the electron EDM. In the summer of 2013, I spent a summer at ACME as an undergraduate under the supervision of Dave DeMille (Yale), designing an electrostatic lens for improving molecule yield. In September 2015 I joined the experiment as a graduate student in the group of Prof. Gerald Gabrielse at Harvard. I made substantial contributions towards the second generation ACME result, which improved the upper bound by a further order of magnitude. I am also working on further upgrades to the planned third generation measurement on the same apparatus. the gauge bosons (W, Z, and gluons) which mediate the weak and strong interactions. Naturally, searches for physics beyond the Standard Model (BSM) have included extensive experimental and theoretical investigations into the existence of additional gauge bosons – both the spin-1 (vector boson) variety as well as their more exotic cousins (scalar and pseudoscalar bosons). The existence of some of these new particles would have potential to explain dark matter or the strong CP problem. 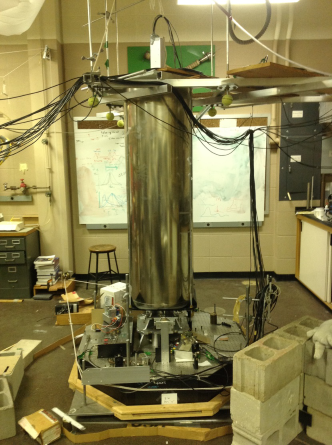 Co-magnetometer apparatus at Amherst College, placed on a rotating table . In the Hunter Lab at Amherst College, we use a cesium-mercury co-magnetometer in a Bell-Bloom configuration to look for evidence of certain interactions mediated by BSM vector bosons, specifically long-range spin-spin interactions (LRSSIs). 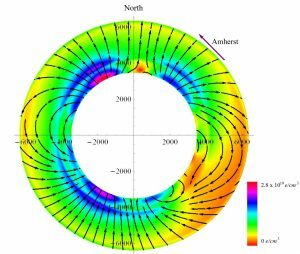 The apparatus consists of an Hg vapor cell sandwiched between two Cs vapor cells immersed in a magnetic field. The atoms in the cells are pumped to a coherent spin state by optically pumping them with circularly polarized modulated light. Afterwards, the pump laser is turned off and a weaker laser tuned several GHz off resonance is used to probe the frequency of the spin precession via detection of Faraday rotation. The apparatus is mounted on a rotating table to allow for different orientations of the spin-polarized atoms. If LRSSIs existed, then the spin-polarized electrons inside the Earth would perturb the spins in the lab apparatus. Cross-section of map of spin-polarized electrons inside the Earth’s mantle, which we use to probe for LRSSIs. This technique of using polarized geoelectrons to look for LRSSIs was pioneered by Larry Hunter in 2013. This technique also allowed experimental bounds to be set for the first time on a variety of velocity-dependent LRSSIs. I spent time during my sophomore and junior years at Amherst assisting Prof. Hunter with these calculations. During my senior year at Amherst, I did work on testing upgrades on the apparatus to reduce systematics from AC Stark shifts. These upgrades are expected to increase sensitivity to LRSSIs by an order of magnitude. Details on this can be found in my senior thesis, In Search of New Geometries for Probing Spin-Spin Interactions. For more information, contact Larry Hunter at Amherst College.